Shahar: Can you please introduce yourself to our readers? How did you get to make music as Capsula and what else is there in your life besides it? Capsula: My name is Yosi Shamay, I'm 31 years old, and living in Israel. I started making music when I was a teenager, playing guitar in a grunge/rock band and then with an old computer, making Prodigy-like music. My first encounter with psychedelic trance/ambient was in 1995 when I first heard the album 'Union Jack-There Will Be No Armageddon', the ambient track from that album 'Water Drums' is for me the best ambient track to this day. 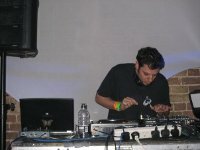 I played around with many genres including Drum & Bass and even House music, but got stuck with Psychill after the first Shpongle album. Music making was always my hobby and I only thought about releasing my music after playing some tracks at a gathering of friends in university and getting great feedback. 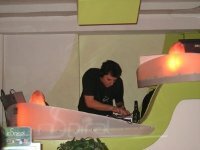 So in 2005 I have released my first track as Capsula 'I know that I know' and my first album 'Synthesis of Reality' with Ajana Records. 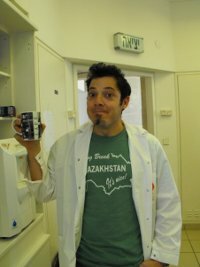 Besides making music, I'm finishing my second year of PhD studies in the field of Chemistry and Pharmacology. I have published two papers in scientific journals and I'm a co-inventor in one patent application. I am also married and very recently became a father to an amazing baby boy. Shahar: You are now releasing your second album- Sense of a Drop- with US based label, Waveform. This album was long in the making; Can you share with us the process of shaping it? Capsula: Actually most of the tracks in the album were made between 2007 and 2008. At that time my roommate was a gifted guitar player, we jammed a lot with his guitar and my newest tracks and I recorded him for some tracks in the album. I got very involved in my research and also wasn't sure with which label to release and then I put it all on hold. In that time Liquid Records also invited me to perform live at a party with Shpongle (which was a dream come true) and also talked about releasing the second album with them. The only tracks I made in 2009 that got into the album were 'Zero One Blues' and 'I still Know that I Know'. Shahar: How did you get to collaborate with Waveform? Capsula: I first got in touch with Forest from Waveform when he wanted to re-release 'I Know that I Know' in the compilation 'Waveform Transmissions Vol. 1'. He said he loved that track and wanted it in his compilation although it was released on both 'Peaking Goddess' and 'Synthesis of Reality'. A while later he asked me if I have more tracks for a new album, I sent him what I had and he liked it. He asked if I can make a remix of 'I Know that I Know' for the new album, because it was still his favorite Capsula track, so I decided to make a kind of a sequel instead of a remix. Melancholyman: I am very interested in cover art for albums, especially those that seems to mediate some kind of message and those that look aesthetically appealing. The cover for Sense of a Drop contains both of these feats. Could you tell us a little bit about the thought behind this cover? 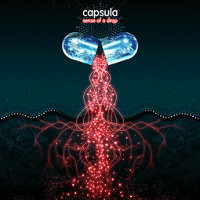 Capsula: The first thought, of course, was of the title and what is it going to be. In any case, no matter what the title was I knew that I want a capsule in it like I did for the first album. The thought behind it was to make drops coming out of the capsule creating a flow of drops. The idea is that a flow as a whole is made of single drops which have their own quality, size, shape, path (the red lines). The same element is with how a wave of light is made of single photons. Sense of a Drop is in the sense of the minimal essence of something, or the quality of the essence of a moment. Melancholyman: On the digipack there is a short text about what you mean by drop: "A drop in the dropiest sense of a drop". It's a "nice" short text giving, as I see it, a certain view of life. That all we do and experience, is just as you say a drop in time, but not a drop in an insignificant way. Rather, that all drops are shared between us in that wonderful sea of awareness and time. This make each drop essential and just as important as the whole sea itself. Am I on the right track here? Capsula: Yes! You are exactly on track. But there are other layers of this view. As you and I say, we are drops in time: the collective of life is the infinite ocean and the individual is one single drop, which in the end goes back to the flow of the ocean and loses its individuality. Another layer or view is not just for the collective-individual relations but also for the individual experience of life. Our flow of experiences creates a continuity, which makes us feel as one coherent person. Each experience in life is made of moments = drops. The collection of these moments/drops is lifetime/sea and of course this can go on and on and on with layers upon layers. Shahar: So what is Sense of a Drop about? Capsula: It's about powerful and intense experiences in life that can be purified to single drops of moments. The tracks both reflect and reconstruct these moments. When you have this kind of a moment you can say it's the dropiest sense of a drop. Shahar: There's a big musical variety in the album, yet it manages to be very cohesive and not to overload, what your vision here and how did you manage it? I intended to use more melodies that are 'guitar solo'-like because I feel it directs the psychedelic feeling very well, or at least I think so. I also tried to push for a more blues oriented direction, although it is obvious only in 'Zero One Blues' and 'Myth'. 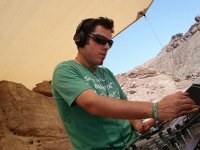 Melancholyman: A sample in one of your tracks states something along the lines of: "if you had an experience it doesn't really matter whether it was true or false, but the important thing is what you can learn from that experience". Do you think that we in general are dogmatic in our view of experiences and that we catalog experiences such as dreams, psychedelic moments, paranoia, etc. as false experiences, which might be a wrong thing to do? Capsula: Indeed! What matters in an experience is what you learn from it or from its meaning. So if you gain something from an 'unreal' experience that is all that matters. This could be true for everything, from dreams to movies to psychedelic experiences. For example, it can be said that the inner experience of what going on in your mind while you are walking in the street is the real thing and not the actual walking. You can walk every day in the same street but each time the inner experience is never the same, different moods, thoughts etc. The dogma that 'what matters are real experiences' is already disappearing in the age of information. Today an abstract idea online with millions of hits is more real than the coffee we drink in the morning. A traffic of words (made from 0's and 1's) between people who will never meet in real life could be much more meaningful than real people we meet in the elevator. As for dreams, I keep a dream journal for the past eight years and regard it as a map to my unconscious mind, it helps me point out what matters to me that I might have missed. Melancholyman: Another sample is from philosopher Alan Watts, a philosopher very dear to me. What is your connection to him and what do you think is the single most important lesson to remember and take with oneself from his teachings? Capsula: From all the psychedelic and non-psychedelic thinkers Alan Watts is probably my favorite. It's a combination of his voice, rhythm of speech, sense of humor and of course the ideas. I can't decide on one lesson, all of his descriptions of the nature of consciousness and reality always touch me. Recently I heard one of his old talks and got caught by something he said that I find quite interesting: "Maybe the only thing that can save technological man from destroying himself, is to treat his neurology directly, to alter it, and some neurologists are beginning to talk about the necessity for peace-technology, you might call it chemical peacefare". For some reason when I heard it I instantly had an image of armed terrorists, prime ministers, soldiers along with business man in suites taking MDMA together, hugging, crying and laughing. Shahar: You use a lot of samples. What is the place of samples in this album and in your music in genral? What comes first, the music or the sample? Capsula: I hold an important place for the speech samples in my music in general, since I am a huge fan of the spoken word. I love anything from lectures, talks, movie dialogues, etc. In this album I think I tried to make the listener think about certain subjects, in particular things of a transcendental nature: myth, subconscious, inner experience, memory, psychedelic state and even the art of machine code (0-1). For me it's both stimulation for the listener to seek more information and also an entertaining sound of the human voice which I adore. Shahar: It seems quite obvious from your music that you are a believer in psychedelics. Care to elaborate on that beyond what the music says. Capsula: I think that psychedelics today are being used in two ways. First, the recreational use or the use for entertaining; And the second type is for self exploration, self realization and for mind expansion beyond the day to day boundaries. I think that from the two, the second is of the greatest importance and holds many advantages for people all over the world. From creativity and psychotherapy to post trauma treatment, I think today more than ever it has a potential to benefit our race. Like Jay Stevens once said, the symphony of the last hundred years as a grand orchestration of melodies went like this: we are doomed unless a way can be found to speed up evolution, to consciously push the smart monkey to a higher level, to renew the assault on the gods, which was the secret purpose of all religions. But can we consciously evolve ourselves? Does a magic trigger exist that is capable of shooting the species forward a few increments? Psychedelics, like sacraments, are like a mind detergent capable of washing away years of old social programming, a re-imprinting device, a consciousness-expander, tools that would push us up the evolutionary ladder. Some even claimed they are a gift, given to mankind in order to save the planet from a nuclear finale. Shahar: Do you think that this second wave of the psychedelic movement that seems to be dwindling left something real and meaningful to the world and to the people who surfed on it, or is it like Hunter S. Thompson says in Fear and Loathing in Las Vegas and again people missed what he defines as the fallacy of the acid culture, the desperate assumption that somebody, or at least some force is tending the light at the end of the tunnel, and so it all will fade away? Capsula: That is a very interesting question. First, I'm not at all sure what is the meaning of a 'psychedelic movement', since there is no manifest, no leadership and political grounds. We are talking about million of peoples around the world who dig the same music, and supposedly share the same values. In the 60s the acid culture, lead by Timothy Leary, was so extreme in relation to the establishment, encouraging people to 'drop out' of society and create an opposite one. This dream, amazing as it was, could not go on forever due to the fact that people grew up, needed money to live, then a job, then an adult life, etc. Today I believe this is quite different because people are more realistic and don't need total revolutions. A weekend of madness in the forest could be followed by a week of routine work in the office. The impact that it has on the world is because it is a lot of people from all around the world who come together to share some positive vibes, act crazy, explore other realms and then go back to normal life. I think this has a huge positive impact on the world. Not mentioning the connection of people from so many countries via the internet with the related common ground of electronic music. In addition, there is a huge awakening in the non-trance psychedelic community since the wide spread use of the internet. Many sites like, erowid, psychedelic saloon and the dopfiend, help to spread the word to millions. Having said that, I agree that most people regard the psychedelic episode of their life as a short phase before they move on and get serious. Even if that is the case, I still feel that this short psychedelic phase in life has a big impact on their life. Shahar: Any future plans for Capsula? Capsula: I am currently working with a friend on psychedelic blues-like music, close to the last track of the album. Also did some remixes to two songs from the 60s and I am planning to do so also for some songs I love from early 90s (alternative rock from Seattle). Shahar: Any last messages and/or links to share? I'm also on facebook, look me up and say hello!